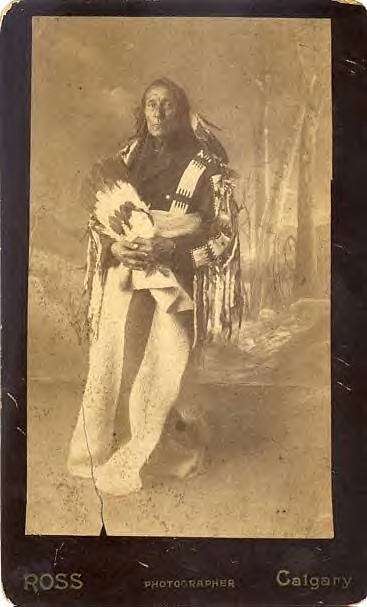 Bobtail, the son of Peechee, had been recognized as a principal Chief not only of the Mountain Cree, but of all the Western Cree bands since the 1870s. It is said that Bobtail, like other Cree chiefs, was also of Metis descendance. His Metis name was Alexis Piché. The top picture is also a Ross. If you got it from the site I think you did, it's not the only photo for which the attribution is wrong. I believe Pollard arrrived on the prairie quite late and I wonder if he sold the images of others under his own imprint - commonly done south of the border, after all - or maybe the site's just plain wrong. I was familiar with the one in the middle but didn't put two and two together and went along with the identification of the top picture as Crowfoot. Haven't seen te bottom one before. Great pictures, as ever. Harry Pollard purchased Alex Ross's negatives and printed some (which the Alberta Archives have mis-identified as Pollard's) Both operated in and around Calgary. Alexis Piché Jr. “Bobtail” (b. 1826) Alexis, whose Cree name was Keskayiwew, was born along the North Saskatchewan River, the son of Alexis Piché Sr. and Opeh-tah-she-toy-wishk, Magdeline O'pitaskewis (a Plains Cree woman). Bobtail, also known as Alexis Piche, Kiskayu, Keskayiwew, or "Gees-guy-oh", Died: Sept. 25, 1900, at Hobema, Alberta. Photo by: Alex Ross, Circa 1886. Albumen photograph on a gold edged and embossed boudoir card "Ross photographer Calgary", (Note that his head position is different than other known examples of this image, also the jacket collar and lapels are positioned differently. The Library and Archives of Canada has this variation of the photo.) Chief of the Bear Hills Cree, brother of Ermineskin. Was elected chief by 1844? to the chieftainship of the Rocky Cree and later became head chief of the Western Cree and head chief of all the groups of the Upstream People. By 1874 Bobtail had 15 lodges totaling 120 people. A respected leader, warrior and guide whose family were seasonal residents of the area of lake Minnawanka near Banff, Alberta. 1849, he married Catherine Cardinal (Pierre)dit Mustatip at Pidgeon Lake. Her father’s name was Pierre Cardinaldit Eia-io-wew and her mother was Marie Catherine Cardinal. Alexis Jr. and Catherine had four children; Cecile b. 1852 at Lac Ste. Anne, Francois b. 1847 at Fort Pitt, Angele b. 1864 at Metis Crossing (Victoria) and Alexis b. 1866 also at Metis Crossing. 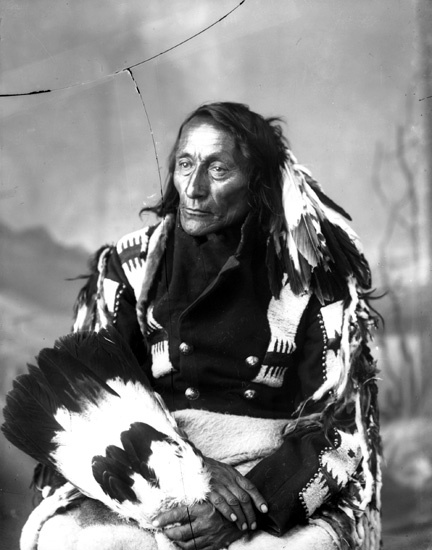 Bobtail’s desired a reserve near Pigeon Lake and on September 25, 1877 Chief Bobtail and two of his Councillors signed an adhesion to Treaty Six. After the 1885 Resistance Bobtail, his wife and his children took Metis Scrip (1886). He had Metis scrip claim # 179 and Catherine’s was # 171. Later he applied to return to Treaty status. 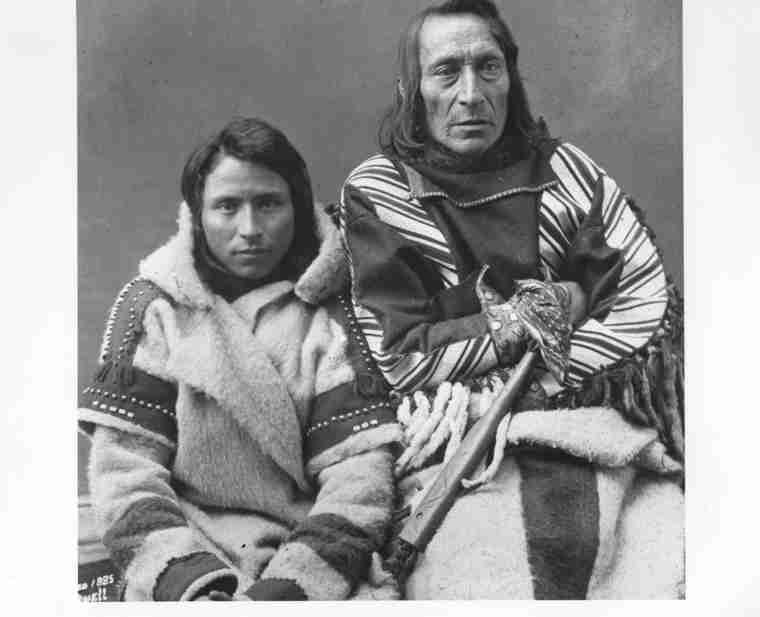 The Bobtail group then spent several years with the Cree of Montana. After the government campaign to oust the Cree from Montana, this group became the Montana Band in Alberta.